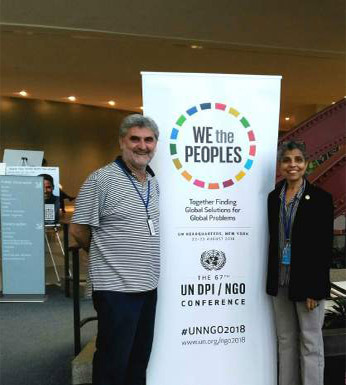 “We the Peoples….” was the theme of the 67th UN DPI/NGO conference (UN Department of Public Information and the NGO/DPI Executive Committee) organized at the UN Headquarters of New York from 22nd to 23rd August 2018. It is the premier event in the NGO calendar at the United Nations. It has attracted more than 2,000 representatives from over 300 international non-governmental organizations representing more than 100 countries. Each Conference focuses on a different UN topic of interest related to the work of civil society and NGOs. It was encouraging that 40% of the registrants to this conference were young people between 18 and 32 years of age from different parts of the world. This international forum also brings together senior UN staff, Member States, international NGOs, academicians, public opinion makers, civil society participants, youth, private sector and international media to discuss issues of global concern. The conference offered to the NGOs an opportunity to put a global perspective on a specific issue. In recent years the focus has been on climate change, human rights, disarmament, global health, sustainability and volunteerism. The goal of the 67th UN DPI/NGO was to allow discussions on the value of multilateralism, opportunities that the newly repositioned UN development system is trying to offer in closer partnership with civil society, innovative approaches, and technologies in advocacy for the 2030 Agenda for the 17 Sustainable Development Goals. But also to explore how to tackle global perceptions regarding the UN’s accomplishments and failures that have shaped attitudes toward the values the Organization represents. This is the largest gathering of NGOs at the UN, organized every two years, and also a unique occasion for them to network and share best practices at the international level. The UN DPI/NGO conference usually explores ways and means for strengthening collaboration between local communities and global institutions, providing a policy-building forum for NGO relationships with the United Nations. Antonio Guterres, the Secretary-General of the United Nations, expressed well this opportunity and potentialities for the civil society and the NGO organizations in these words: “We have no greater partner than you, the non-governmental organizations. Together, you can help break cycles of poverty that have lasted for generations – and trigger transformational change that endures for generations to come. The United Nations is committed to working with you for a more peaceful, just and prosperous future for all”. 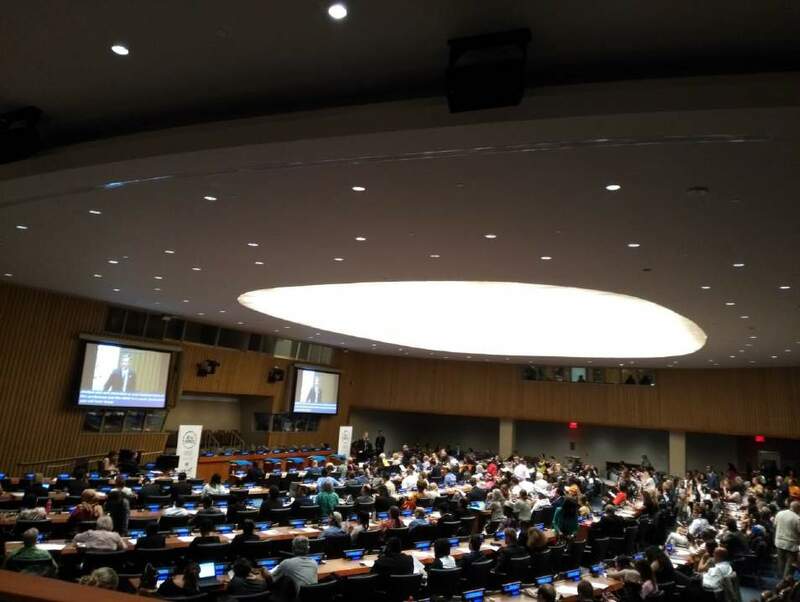 The Conference aimed to build on what has already been accomplished by greater NGO and civil society participation in many of the debates taking place at the United Nations, including Informal Interactive Hearings by the General Assembly President with NGOs, civil society and private sector representatives. Speakers at the Conference have been asked to illustrate their work on the ground by real-life examples of effective partnerships to achieve the United Nations agenda, including the Sustainable Development Goals (SDGs). In the two final documents (one for all the participants and another of the youth), the participants affirmed that “People-centered multilateralism requires expanding the role of civil society partnerships, especially with youth, to advance the SDGs. The United Nations’ legitimacy depends in part on its ability to build consensus in a world where state power has become more diffuse and where non-state actors play a substantial role. When the current multilateral system falters, opportunists argue against the idea that cooperation helps everyone. In place of multilateralism, they cultivate a narrow nationalism that promises development for some at the expense of all others, especially the most vulnerable. The Assembly rejected the false choice between nationalism and globalism. The people-centered multilateralism is an optimistic and realistic alternative. Its inclusive processes will foster a sense of shared ownership, build trust and result in a greater effectiveness”. Global problems are beyond the power of any single entity to tackle; partnerships are essential to create and facilitate lasting change. Multilateralism is more than partnership by multiple entities, but rather inclusive collaboration of states and non-state actors. The civil society claims its unique space for action that transcends national identities and other affiliations. A structure like the United Nations that brings together all the 193 countries of the world with their own civil society should be the institution that enhances and supports a change of mentality and relationships among the nations trying to instigate and implement reforms on their different levels of service of their structure. The goal of being more effective and with more “moral and political power” has to be supported, encouraged and clarified by the civil society of the world. In order for people-centered multilateralism to take root, civil society must be able to carry out its critical work. However, every day, civil society representatives face threats to their physical safety and their rights to advocate. Many activists and people belonging to associations and organizations are being arrested, abducted and even murdered with impunity. Progress toward sustainable development requires a multilateral system that effectively safeguards non-governmental actors and citizens. The 2030 Agenda for Sustainable Development provides a global blueprint for dignity, peace and prosperity for people and the planet, now and in the future. Three years into the implementation of the Agenda, countries are translating this shared vision into national development plans and strategies with some achievements and some difficulties with progress that is insufficient. The role of the authentic and people-centered NGOs in the world, as part of the global civil society plays a crucial and important role as Secretary-General Guterres states in his report: “This ambitious Agenda necessitates profound change that goes beyond business as usual. In doing its part, the United Nations has launched reform initiatives to reposition the United Nations development system to deliver on the 2030 Agenda. The objective is to be more effective, cohesive and accountable. We stand ready to work with all Member States to make the Sustainable Development Goals a reality for everyone, everywhere”.